The Patient Protection and Affordable Care Act (ACA) of 2010 created numerous protections for patients with cancer, including mandatory coverage for people with preexisting conditions and an array of essential health benefits. But these requirements may have inadvertently accelerated the use of narrow networks to control health plan costs on the ACA marketplace. Despite shifting federal health policies, state marketplace health plans insure nearly 12 million Americans in 2018.1 To understand the composition of narrow networks on the exchange, the National Comprehensive Cancer Network (NCCN), in collaboration with Avalere Health, examined network exclusions for high-quality academic cancer centers and the potential health implications for enrollees with cancer. This paper will present survey results examining the experiences National Cancer Institute (NCI)-designated cancer centers have had with the marketplaces, the implications for patients' access to cancer care, and proposed policy solutions. About 21% of marketplace plans available in 2017 had narrow networks, defined as having 25% or fewer eligible physicians in a plan area.6 Narrow-network plans are popular for their competitive premium pricing, but consumers may not fully understand what they are purchasing. Surveys by the Commonwealth Fund have shown that 20% to 25% of marketplace enrollees did not know that the plans have differing networks, while McKinsey & Company has found that more than 40% of new enrollees in 2015 were unaware of their plan’s network configuration.7 Understanding network design is particularly important for enrollees living with cancer or diagnosed during their time enrolled in an exchange plan. In 2015, the Leonard Davis Institute of Health Economics at the University of Pennsylvania (Penn LDI) found that across insurance plans on the exchanges in 2014, network exclusions were particularly prevalent in oncology: 59% of plan networks of oncologists were classified as small (less than 25% of eligible physicians) or extra small (less than 10% of eligible physicians).8 Analyses of narrow networks on the exchanges have found that NCI-designated cancer centers are more likely to be excluded from narrow-network plans.9 Excluding academic cancer centers from narrow-network plans may inhibit access to high-quality cancer care for exchange enrollees. Studies have found that treatment at academic cancer centers is tied to higher overall survival.10,11 NCI-designated centers offer specialized services often unavailable elsewhere, including interdisciplinary team-based care, the latest therapies and advancements in cancer treatment, cutting-edge technology, and greater access to clinical trials. Patients on narrow-network plans that prohibit academic cancer centers may be less likely to access treatment at out-of-network centers because of higher cost sharing. This may be particularly problematic for patients with rare or advanced cancers, who could benefit from care at an academic cancer center. In 2015, NCCN and Avalere Health sought to better understand cancer centers’ initial experiences with exchange plans.12 In January 2018, NCCN and Avalere Health surveyed NCI-designated cancer centers to further understand their participation in the 2017 and 2018 exchange marketplace. Surveys were sent to directors or vice presidents of payer or managed care contracting and to individuals with similar titles at the 61 NCI-designated cancer centers. The survey was completed by 29 NCI-designated centers from 21 states and Washington, DC. Most respondents (82%) were from NCCN institutions. The survey found that 93% of cancer centers are out of network for some or all health exchange carriers in their state. Furthermore, the inclusion of major cancer centers on marketplace plans varies significantly. Some reported coverage in 100% of exchange plans in their state; others said they are out of network for all exchange plans. For example, centers in Connecticut and Maryland had less restrictive networks, while centers in Illinois, Minnesota, Nebraska, North Carolina, Pennsylvania, and Texas had more restrictive networks. In addition to narrow networks, tiered networks also use higher or lower cost sharing to guide patient care. Under both, patients might incur higher out-of-pocket costs or reduce or delay necessary treatment.13,14 For 2017, 55% of respondents said their states have tiered provider networks. Of those who were able to indicate their tier, more than half were in Tier 2 or 3, which would result in high enrollee cost sharing (Figure 1). For 2018, centers’ placements in tiered networks was relatively consistent with 2017. According to the National Cancer Database (NCDB), more than 250,000 Americans traveled more than 40 miles for cancer care in 2015.15 For some patients, this included out-of-state travel, which poses network inclusion challenges. The majority of centers (59%) were unsure what percentage of their 2017 exchange patients were from out of state, and the majority of the remaining centers said that 10% or less were from out of state. 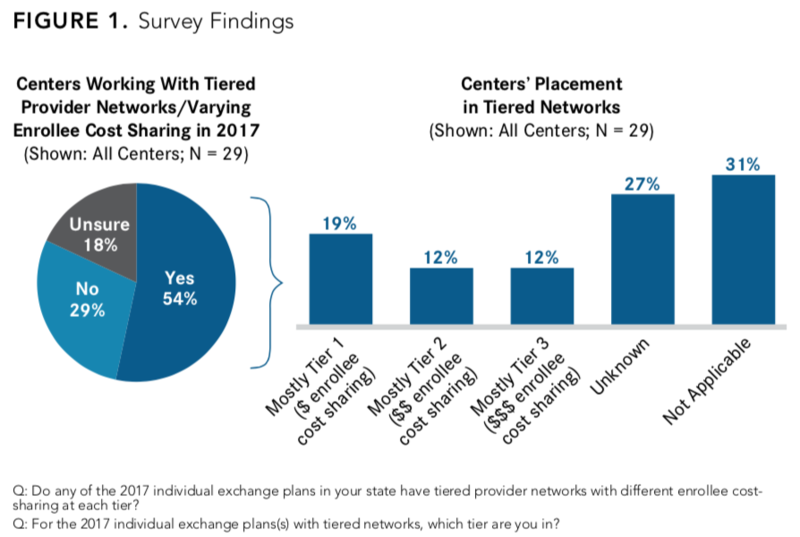 Although 52% of centers said they were out of network for out-of-state plans, 26% were in network for plans in some border states and none were in network for all exchange plans from border states (Figure 2). The survey results expose marketplace challenges, including network variance across regions, high enrollee cost sharing under tiered networks, and network inclusion barriers for out-of-state patients. Because more than 93% of responding NCI-designated cancer centers reported that they are out of network for at least some of their state’s exchange plans, education on network configuration is needed for consumers to make informed purchasing decisions. Exchange enrollees may benefit from transparent, accessible, and user-friendly information on their plan’s networks for specialists. Further research is needed to determine the most effective mechanism to educate consumers about exchange networks. Some groups argue that state marketplace websites could include clearly marked labels for each plan’s network size.8 Recently, however, the Centers for Medicare and Medicaid Services (CMS) has dramatically reduced the role and funding for health care navigators. Exchange navigators have had their funding reduced by 84% since 2016, which may affect their ability to educate consumers about provider networks.16 It remains to be seen how those significant gaps will be filled. In addition, CMS has given states greater authority to oversee the network adequacy requirements on the exchanges. States already had significant authority to enforce network adequacy, which may explain why some state exchanges sell no plans with narrow networks and others comprise more than 80% narrow network plans.17 The change increases state autonomy in reviewing the qualified health plan certification standards of network adequacy by allowing states to rely on state reviews or issuer accreditation.18 This may result in wider disparities in network size. are likely to have high out-of-pocket costs at out-of-network providers, face a delay or reduction in treatment, or seek care from a provider who may not be optimally equipped to treat all cancers. 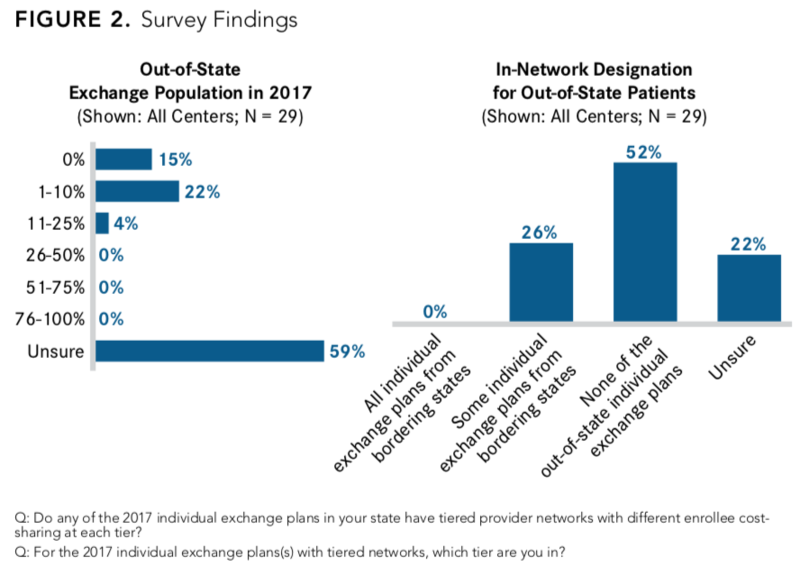 This survey focuses on narrow networks on state exchanges, but they are increasingly used in other markets, including Medicare Advantage plans, which are likely to have higher rates of beneficiaries with cancer. Further research is needed on the implications of narrow networks for beneficiaries with cancer in the broader insurance market. Narrow networks and tiered networks have become popular ways of controlling costs on the exchange. But inclusion of academic cancer centers on these plans varies widely, which can impede enrollee access to needed care. Patients with cancer who do not have an in-network academic cancer center may be unable to access the latest treatment advances, clinical trials, or specialized care. Additional research is needed to better understand the health outcome and out-of-pocket-cost implications of narrow networks for enrollees with cancer, including patients with rare or advanced cancers. Finally, wide variance in center inclusion across exchange plans, coupled with reduced funding for navigator programs, indicates a need for increased consumer education efforts on exchange plan network design and breadth. Alyssa Schatz, MSW, is the director of policy and advocacy at the National Comprehensive Cancer Network, which seeks to improve the quality, effectiveness, and efficiency of cancer care. Previously, she worked in behavioral health and disability policy. Schatz received a master’s of social work with a policy concentration from the University of Pennsylvania and a bachelor’s degree in social work from Eastern Connecticut State University. Katy Winckworth-Prejsnar, MPH, is a senior policy and advocacy fellow at the National Comprehensive Cancer Network. In her role, Katy tracks legislation and global cancer-policy issues. Previously she worked at Drexel University as the project coordinator for the Pennsylvania Mental Health & Justice Center of Excellence. Winckworth-Prejsnar received a master’s of public health with a global health concentration from Drexel University Dornsife School of Public Health. This survey was supported by a grant from Genentech.